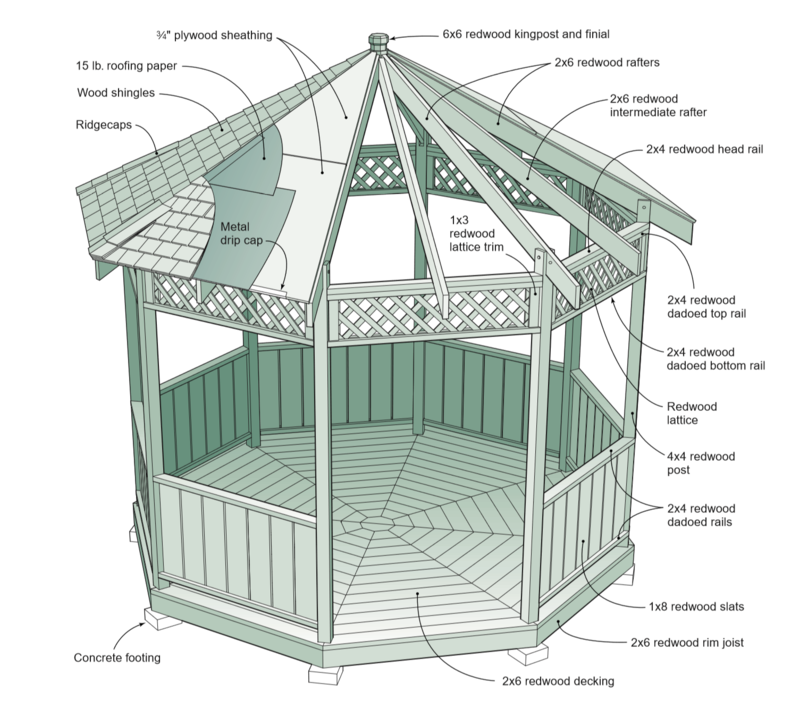 How To Build A Wooden Gazebo? You build a beautiful backyard patio, create lush gardens around the edges, and surround it with grass so green that it almost hurts your eyes. Still, something is missing. While the patio creates a useful space just outside the back door, the rest of the yard doesn’t really provide any sort of gathering place. It needs a focal point. It needs a Gazebo. I don’t know where that silly name comes from, but small covered porches have adorned the most beautiful gardens going all the way back to the Egyptian culture of 5000 years ago. With a track record like that, it’s little wonder that no backyard looks complete without one. The modern-day solution is to run off to the local home center and buy a pop-up or ready-to-assemble metal framework with a soft roof covering. Yeah…But…No. That might look good for a month or so, but once the sun and weather start taking a toll, the thing is going to be a shabby excuse for a backyard hangout. 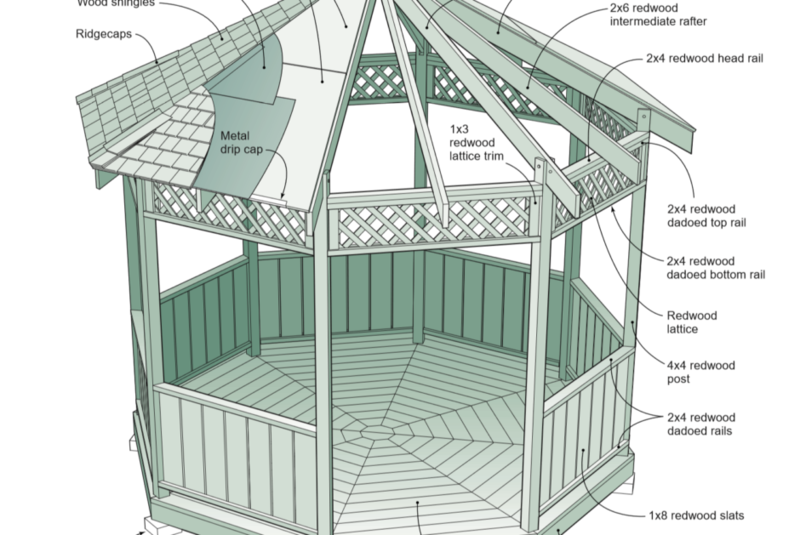 If you poke around on the internet, you will find all kinds of Gazebo building plans. Oddly, many of them start with instructions like “Purchase the Gazebo Kit #123 from our company website…” Again, No. Now, some of those kits might be very nice. I have studied them and I’ll admit that a few of them are worth considering. Unless, of course, you take pride in your woodworking. So, get out some heavy-duty tools, some advanced know-how, and prepare to get dirty. We’re building a real Gazebo! Speaking of tools, you remember my blog a while back about 5 tools every advanced carpenter needs. One of the essentials I discussed is the compound miter saw. I hope you took that suggestion to heart, because you won’t get through this project without one. The Gazebo plan I like is actually supplied by the California Redwood Association. You will want to download a PDF of the full plan here. 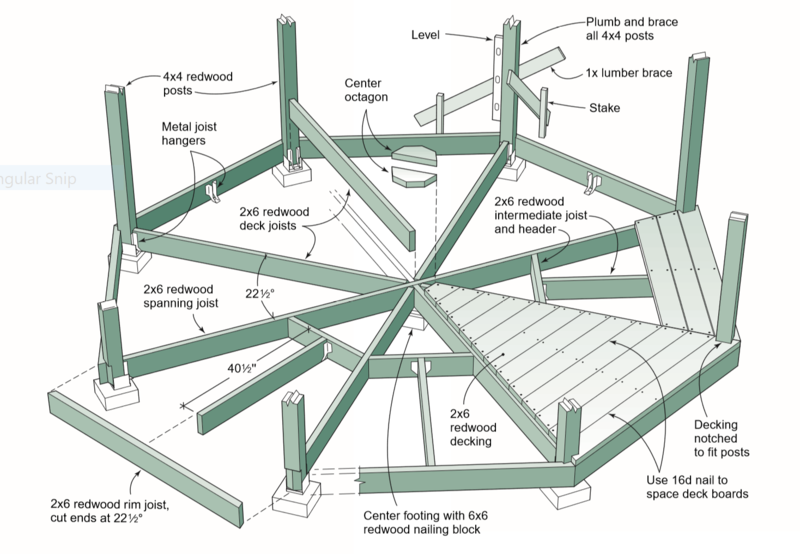 Naturally, they recommend building the Gazebo out of California Redwood, and I don’t disagree. Redwood is a perfect lumber choice for any outdoor construction project. It is durable, weather-resistant wood that resists insects and doesn’t shrink and swell with temperature and humidity changes nearly as much as many other lumber choices. 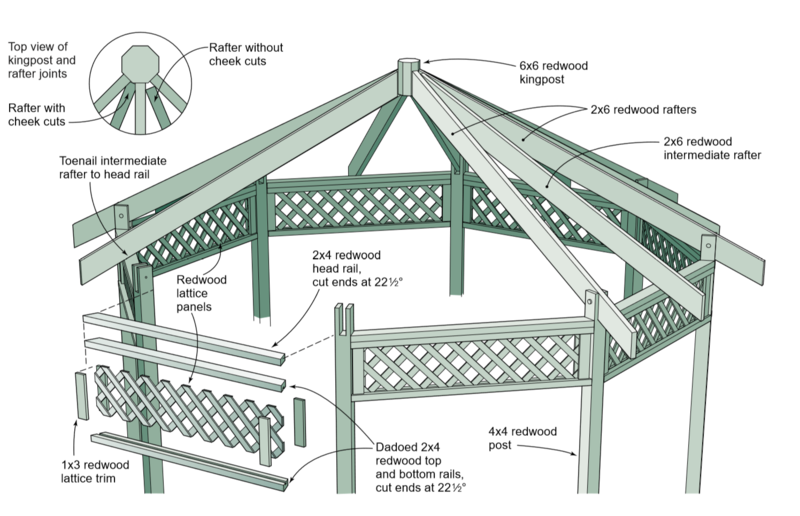 It’s a bit pricey upfront, but with a relatively small amount of care your Redwood Gazebo will outlive all of us. This Gazebo begins (Where else?) with a great deal of accurate measurement. The traditional shape of a Gazebo is an octagon, basically a square with the corners cut off to create eight sides of equal lengths. The angle or each of the 8 corners is going to be 22 °. Yes, it is that precise. To start, you will construct some temporary rails, called batter boards, that will serve as the anchor points for your measuring strings. 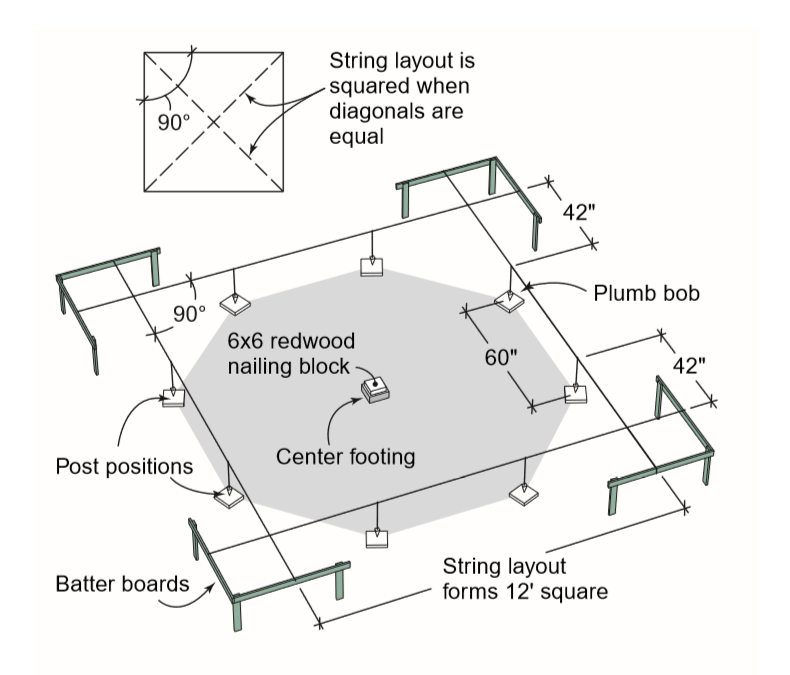 Once your strings form a perfect 12’ square, they will be used to mark the locations for 9 concrete footings – one at each corner of the Gazebo and another in the center. While your concrete footers are curing, you have some cutting to do. The eight 4×4 posts will need to be cut to 9 feet 5 inches in length. Each one needs a 1 ½” notch cut in the top that the rafters will drop into and be bolted in place. Each post also needs a pair of matching 22 ½° bevels cut into the bottom end where the rim joists will be mounted. Rim joists, deck joists, headers and deck boards will also need that same angle. Once the headers have cured, the posts are mounted using metal post anchors, plumbed and braced in place. Next the deck joists are installed, followed by headers and intermediate joists and capped off with the rim joists. The next step is to install the decking, and things are starting to take shape. At this point you should begin feeling good about the project, because the hard part has been done. Of course, the next steps all take place up on the ladder, so it’s not getting that easy just yet. Head and bottom rails that have been dadoed to hold the lattice go up next, along with the lattice, of course. Naturally each rail needs to be trimmed to our favorite angle. The sixteen rafters, all centered on a kingpost, are next. Just to keep things interesting, the end cuts on the rafters are 26 ½° – 4 degrees different than everything else you have been cutting. Next up is the actual roofing, and here the plans offer several choices. You can create a redwood slat roof, shingles over spaced sheathing, or shingles over plywood and roofing paper. This is a purely aesthetic decision, as is the type of railings you install next. Several optional designs are also outlined in the plans. Finish it off with a ton of sanding and a clear water repellant finish that contains a mildewcide, and your Gazebo is ready to provide years and years of pleasant backyard enjoyment. If you’ve never worked with redwood before, there are a few terms you should know before you purchase the lumber. There are four grades of redwood. Construction Heart or Deck heart is knotty heartwood and is the grade to use for ground-level load bearing applications. Deck Common is used for the decking and above-ground applications, like the rafters. Merchantable Heart is heartwood and is also good for ground-level usage. Merchantable is sapwood that is used for railings, fences and other above-ground applications. The California Redwood Association also recommends avoiding the use of common nails and screws because they will cause stains that mar the beauty of this fantastic wood. Instead, opt for stainless steel, aluminum, or high-quality galvanized fasteners. I told you this was no small project. But the PDF instructions provided by the California Redwood folks is very clear and precise. Even an intermediate woodworker should be able to follow the plans without difficulty. That doesn’t mean the job will be easy. There is a great deal of precise work necessary to arrive at a great outcome. But sacrificing a couple of weekends to build a gorgeous redwood Gazebo that will supply many happy years of backyard lounging is well worth it.